The Fed's forecast, published last month, has inflation reaching the threshold of concern only in 2012/2013 (see Table 1) based on the personal consumption expenditure price index and a little later if the core personal consumption expenditure price index, which excludes food and energy, is the preferred price measure. The recent upward trend of the Consumer Price Index (CPI), both the all items index and the core CPI has raised the level of concern. The CPI has moved up 2.1% in February from a year ago and the 3-month annualized increase stands at 5.6%. The core CPI has advanced 1.1% from a year ago and 3-month annualized gain is 1.8%. The March 15 policy statement of the Fed sees the recent higher energy and commodity prices as problematic but the Fed views these effects as "transitory" and it is following closely the "evolution of inflation and inflation expectations." 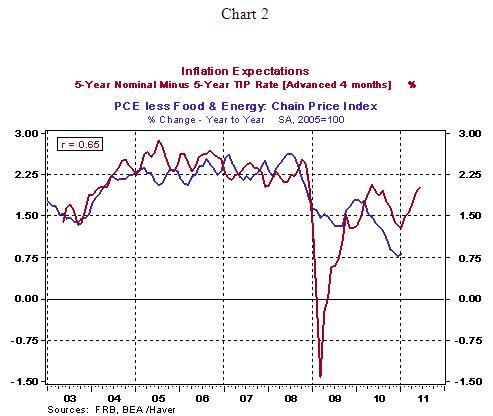 A forward looking Fed will be tracking inflation expectations as noted in the policy statement. The year-to-year change in the personal consumption expenditure price index all items/core advanced 4 months/3months has a positive and strong positive correlation with inflation expectations, as measured the difference between 5-year Treasury note yield and 5-year inflation protected security (see Charts 1 and 2). These market measures of inflation expectations will give a fair warning of impending inflation. For now, inflation expectations are contained and do not present a threat. The federal funds rate held at 1.0% between June 2003 and June 2004. 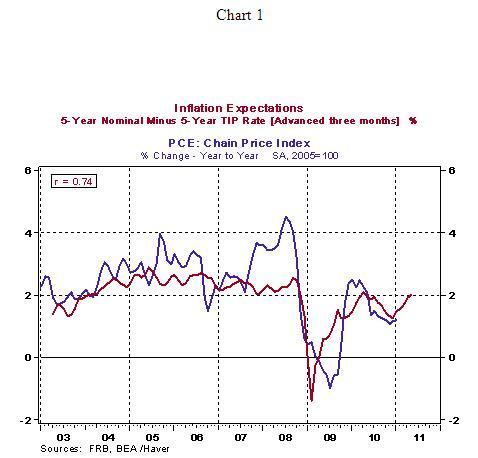 In May 2004, the 5-year break even inflation number stood at a low of 134 bps (see Chart 1). This reading moved up to 250 bps by June 2004 when the Fed commenced raising the federal funds rate. The recent low for the 5-year break inflation reading was 119 bps on August 24, 2010, which moved up to 220 bps as of March 21, 2011. The correspondence with the past is imprecise, history is a rough guide. It is also important to note the unemployment rate in June 2004 was 5.6% not 8.9% as in February 2011. In other words, economic conditions today are significantly different from the previous monetary policy tightening episode. Also, inflation expectations can linger around these readings for several quarters amidst moderate economic growth.